One of my ongoing projects involves an analysis of the composition and revision of Pale Fire. The holograph (handwritten) manuscript of PF resides in the Library of Congress and is now accessible to scholars on microfilm via interlibrary loan. I was lucky enough to visit the LOC back before the manuscript was photographed, and I have to say that while the increased access afforded by microfilm is wonderful, the quality of the images (especially to one trying to decipher cancellations and scrawled variants) does not approach the originals. The few photocopies that I was able to make of the original cards are much clearer than the .pdf downloads I obtained from the machines at the LOC. 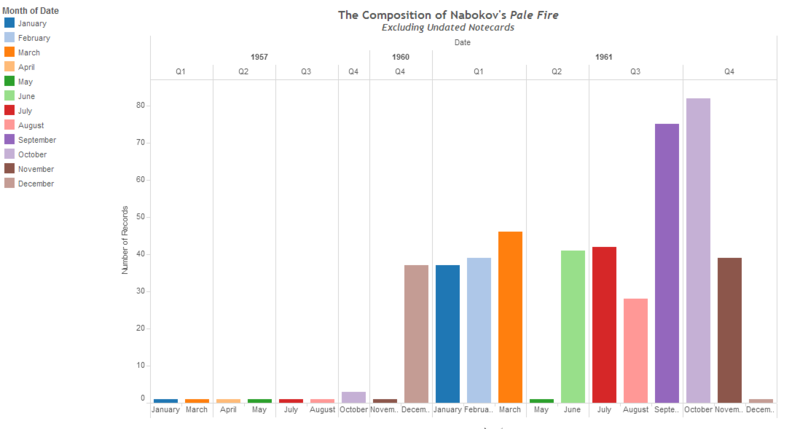 All that aside, I have been interested in developing a series of strictly data-based visualizations that would show Nabokov’s pace and method of composition. I have a ways to go in terms of my knowledge of data visualization, but I did find a handy, free program called Tableau that allowed me to create the bar graph below. The graph is organized by month and shows the volume of dated notecards VN produced during the composition of the novel. I should note that only about half of the cards in the manuscript are dated, so this chart does not present a complete view of novel’s composition. Below the chart is a link to a more dynamic version of the data, which allows you to click on the bars and see the underlying data from the original Excel sheet.